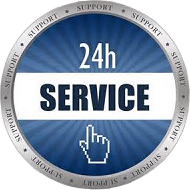 Monitoring Services – 24 x 7 x 365 peace of mind for you and your network. Network monitoring is the backbone of a truly proactive approach to network support. Networks that have no monitoring are akin to cars running without a dashboard or guages. Simple, easy-to-fix issues can blossom into full-blown emergencies without a proper monitoring solution on your network. A monitoring solution can help your company in a number of ways; by supporting your currently lean IT staff through the automation of routine maintenance functions and providing the alerting and reporting capabilities necessary for capacity or server consolidation planning. Or for smaller firms, it can allow your IT vendor to diagnose and troubleshoot problems before they become critical, thus reducing expensive onsite support visits. A good network monitoring solution can also reduce the time it takes to resolve IT issues by helping to clearly identify the problem device and cause. At The LCO Group, we provide 24×7 monitoring services, remote troubleshooting and remote network management, and clear escalation policies and guidelines. We pride ourselves on being a proactive support provider, and believe that every client should have a monitoring solution in place; no matter how simple it may be. If your server crashes or your network is “down”, rapid resolution is critical. Server issues often affect every user on your network. You cannot afford to wait until tomorrow or the next day for an answer. The LCO Group has the ability to access your server from a remote location and provide fast, efficient support in minutes, not days. If required, The LCO Group can dispatch a technician 24 x 7 x 365. The LCO Group can show you how good an outsourced IT consulting firm can truly be.